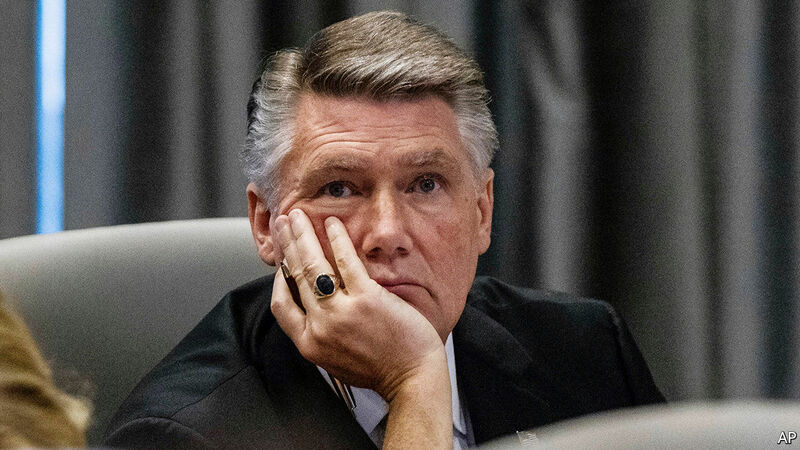 NORTH CAROLINA’S ninth district has no representative in Congress, the state’s election board having refused to sign off on the dubious victory of Mark Harris (pictured), a Republican, in the mid-terms. Instead it launched an investigation into allegations of fraud by a colourful political consultant who worked on his campaign. Yet in the months since, Mr Harris, supported by his party, has refused to countenance a new election and insisted that he was the rightful winner. But that suddenly changed on February 21st—the fourth day of an election-board hearing into the allegations against his campaign. Mr Harris, a Baptist minister, admitted that some of his testimony had been “incorrect”, and called for a new vote. Less than an hour later, North Carolina’s five-member election board ruled unanimously that the district should go to the polls again. It will be the first time a congressional election has been repeated in America since 1975. The allegations concern Leslie McCrae Dowless, a political consultant based in Bladen County, and the manner in which he worked on absentee ballots. This week Mr Harris testified that he had known Mr Dowless—a “good ole boy”—was knocking on doors, helping voters obtain absentee ballots, which is perfectly legal. He also said Mr Dowless had assured him he would not collect the ballots himself, which is not. Campaign officials and Mr Harris have said they did not pay Mr Dowless to break the law and Mr Dowless, who did not testify this week, has denied wrongdoing. He has not been charged with any crimes in connection with the election. But regulators had been struck by the disproportionately high number of absentee ballots Mr Harris won in Bladen County, in the rural south-east of the state. Voters there and in at least one other county claimed that Mr Dowless and his workers collected the ballots, and in some cases also filled them in and mailed them. The most dramatic testimony came from Mr Harris’s son, whose appearance at the hearing appears to have taken his father by surprise. John Harris, a federal prosecutor, said he suspected that Mr Dowless had broken the law in an earlier election campaign—and that he had told his father of his suspicions in emails and telephone calls. “I thought what he was doing was illegal, and I was right,” John Harris said, adding that he had no reason to believe that his father, mother or any other campaign associate had any knowledge of that. “I think Dowless told them he wasn’t doing any of this, and they believed him,” he said, as his father sat listening to him in tears. Mr Harris’s case was further undermined when his lawyer failed to hand over campaign records including emails between him and his son until 15 minutes before his son was due to testify. The election board chairman said that was “unacceptable”. Election fraud of any kind is unusual in America. But while Republicans have fretted about fraud by individual voters, using it to justify sometimes stringent voter ID laws, it seems they should worry more about campaign fraud. John Harris testified that he had become curious about absentee ballots in 2016 after his father had lost the Republican primary to Todd Johnson, who had won 98% of the absentee vote. Mr Harris had discovered then, he said, that mailed ballots had arrived “in batches” which seemed suspicious. Mr Dowless, who has been hired by Democrats as well as Republicans in the past, had worked on Mr Johnson’s campaign. With his help two years later, Mr Harris took 96% of the absentee vote. The ninth district is now preparing for a special election that will include a primary. A date has not yet been set but it is likely to be several months off. The fresh vote will give Democrats a second crack at a district that, though long Republican, has been described by the Cook Political Report as a “toss-up”. The Democratic candidate, Dan McCready, is expected to run again. Mr Harris, who blamed his troubled testimony on illness, including a sepsis infection and two strokes that impaired his memory, may not. Previous PostPrevious What would a no-deal Brexit mean for immigration?